Need more or new posters to decorate your room, locker or office? If you are an Austin Mahone fan, then this just might be the collection you are looking for. 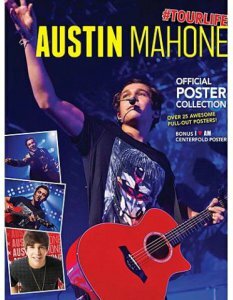 Each poster in this collection is colorful and features Austin Mahone in different aspects of his life. Whether it is on stage performing, a promotional photo shoot or just gazing into your eyes, this is a collection that out does any other posters of Austin. This official poster collection book measures approximately 8.5 inches by 11 inches. It includes over 25 pull out posters including a centerfold poster that features I love AM.